BinaryLabs Takes iPad in New Direction with Hand Therapy App - Inspired by his daughter's need to improve her fine motor skills, app developer Frank Jensen is leveraging the multi-touch capabilities of the iPad into a tool to improve fine motor skills in kids and adults. BinaryLabs is turning the iPad into a tool for improving fine motor skills with the introduction of Dexteria, a new app for the iPad. The app features interactive multi-touch activities designed by licensed occupational therapists. "There are thousands of apps for the iPad, but very few of them take full advantage of its unique user interface," said Jensen, CEO of BinaryLabs. "The iPad can detect several simultaneous touches. I asked, 'Other than gaming, which is a saturated market segment, how can I put that capability to good use?'" The answer came to him immediately. "Like many kids, my kindergarten-aged daughter was having challenges with her fine motor skills," said Jensen. "The key to improvement was a consistent regime of hand and finger exercises. I wanted to be sure she was ready for kindergarten, and fine motor skills are often overlooked as an important factor in school-readiness. Dexteria helps kids get ready for school." 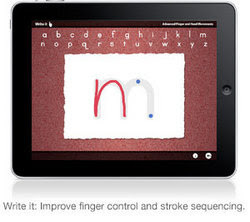 The app is available now in the App store for an introductory price of $9.99 and features interactive exercises that require specific finger and hand movements. They combine the principles of game design and occupational therapy to form an engaging, repeatable experience. "Most iPad medical and healthcare apps are used for reference or data entry. Dexteria is the first app that transforms the iPad into a manipulative tool that can be used directly for therapy," said Jensen.